Running is a great way to stay healthy and fit, and it has been proven to do miracles both for the human body and mind. The problem is often motivation and convincing yourself to tie on those running shoes and head out for a workout. 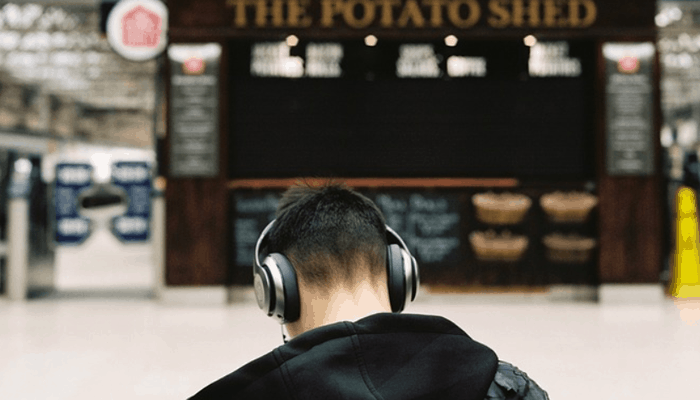 Music can be a great motivator, but for this to be effective, you need to make sure you are listening to your favorite songs in a way that does not distract from the run. 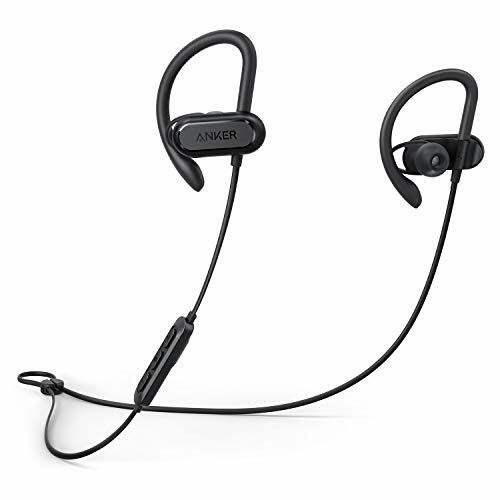 Best headphones for running in hot weather? Best headphones for running in the rain? By using the best running Bluetooth headphones, you set yourself up for success, as you won’t have to worry about the earplugs falling out of your ears or about traffic noise draining the sound of your favorite singer’s voice. But what are best earphones for running? Below are a few good options for those who love to run, and for those who are thinking about engaging in a new and healthier lifestyle. You can’t be on the hunt for the best running headphones without having a look at these affordable sport headphones! The HD sound has a powerful base, Bluetooth 4.1 and tips made with revolutionary Comply T-400 memory foam that adapts to your ear. The fit is so comfortable and customized that it shuts out most other noise, and the waterproof material makes it safe to go for a run in the rain, to sweat and even to accidentally drop the running earphones down the toilet. 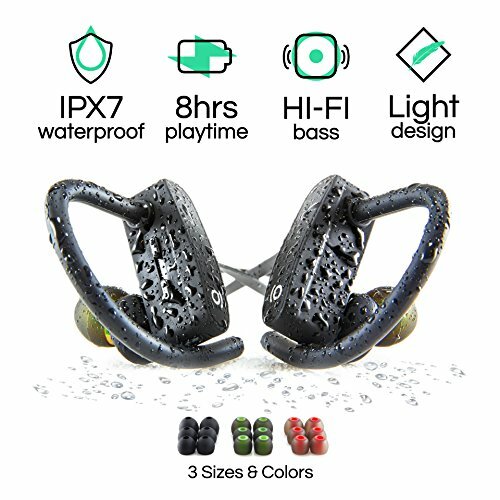 They are also sweatproof, and the company is so sure of this that their products come with a lifetime promise of replaced headphones if they are ever damaged by sweat. Why We Liked It - These are possibly the best Bluetooth sport headphones thanks to being lightweight, staying in place while you are in movement and shaping themselves to the inside of your ear! Style, comfort and durability are three words that perfectly describe these Bluetooth running headphones, and they are a great option for anyone who is searching for the best sport wireless headphones out there. 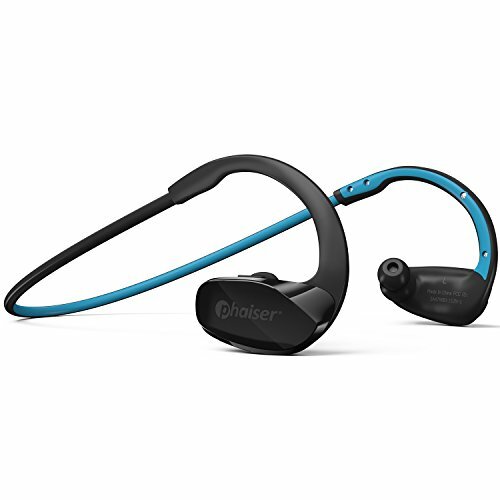 The Bluetooth 4.1 CSR technology sets the bar high in terms of sound quality, and the flexible ear hooks keep these running headphones in place even during intense workout sessions. 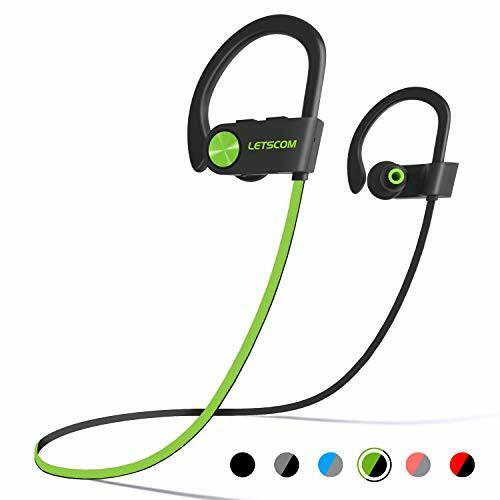 It connects with any Bluetooth device located up to 30 feet away, which is quite impressive considering their small and practical size, and the noise suppression technology allows you to listen to your music without distractions or take a call as you jog! Why We Liked It - The best headphones for running and exercise, since they stay in place, last long without having to be recharged and they keep exterior noise out for a satisfying listening experience. 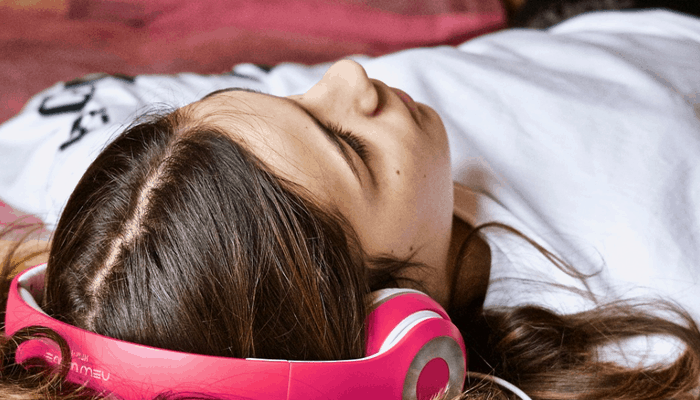 Listen to music for 25 hours straight without having to recharge or enjoy up to 600 hours of standby time when they are not in use. The battery level can be tracked on an iOS device, making it easy to know when you need to charge your headphones so that you never have to worry about running out of juice just as you are listening to your favorite training motivation song. These wireless headphones for running are comfortable to wear for long time periods, have a built-in microphone, noise cancellation technology, balanced audio and – check this out – they come with a protective travel pouch so that you can take them with you no matter where you go. Why We Liked It - For those who prefer over the ear Bluetooth headphones for running – this is a product worth considering! 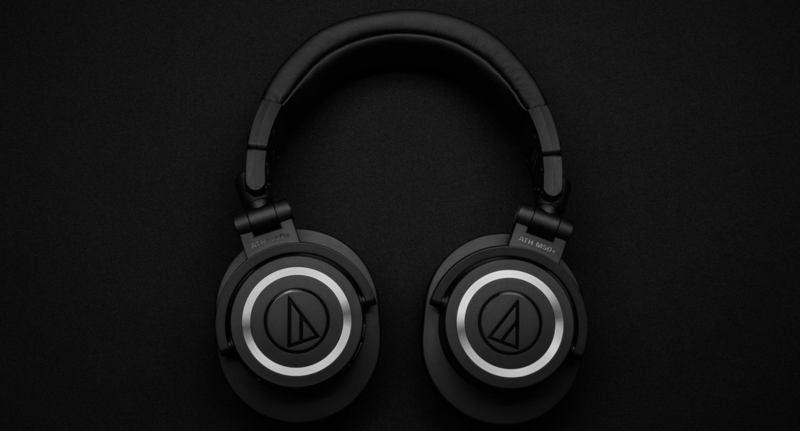 Superior comfort and sound at a very affordable price. A unique feature of this Bluetooth headset for running is that it comes in different sizes, so that you can choose one that perfectly fits your ear and head. This makes exercise more fun and less of a hassle, as you won’t have to worry about earplugs falling out or causing discomfort. The sweat-proof technology helps combat corrosion, which could otherwise occur due to sweat, and keep your jogging earbuds looking and sound their best for a long time to come. By getting the best wireless headphones for running, you don’t only get an impressive sound experience, but also a product that will make your workouts both easier and more motivational. 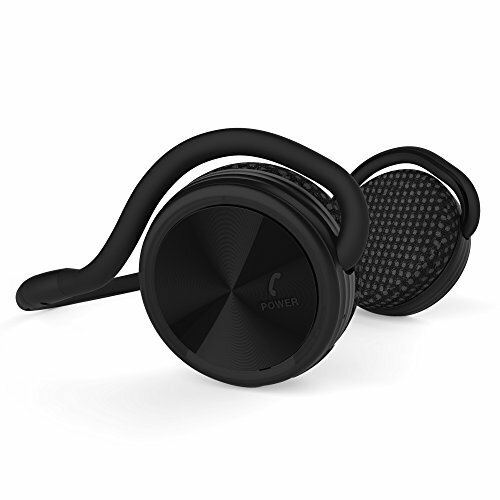 Why We Liked It - These Bluetooth headphones for running, exercise and other activities have a well-balanced sound that is so clear you can have an important phone call in the middle of a noisy gym, and they adapt perfectly to your ear thanks to the various size options. Self-proclaimed as the best Bluetooth headphones for running – this product does not disappoint! With V4.1+Edr for stereo sound and impressive bass, these running earbuds stand out when it comes to both function and design. 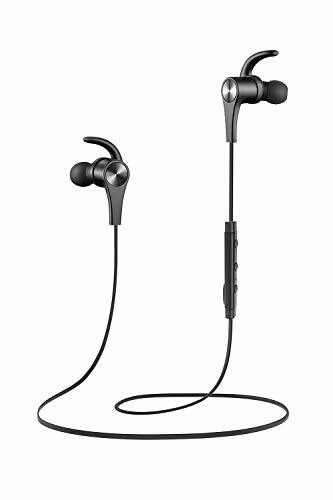 They are earphones for running that don’t fall out; sweat proof and water resistant, with voice notifications for incoming calls, a comfortable ear-hook, up to 8 hours of interrupted music and much more. The sporty exterior makes you want to pop them straight into your ears and head out for a run, and once you hear how clear the sound is – you won’t ever want to stop running. Motivation comes in many shapes and forms, and these are perhaps the best sports headphones for someone who needs that little extra push. Why We Liked It - Finding the best wireless earbuds for running can feel tricky at first, as there is a large selection available online, but you can’t go wrong with a pair of these light-weight and sound-wise superior wireless sport earbuds. 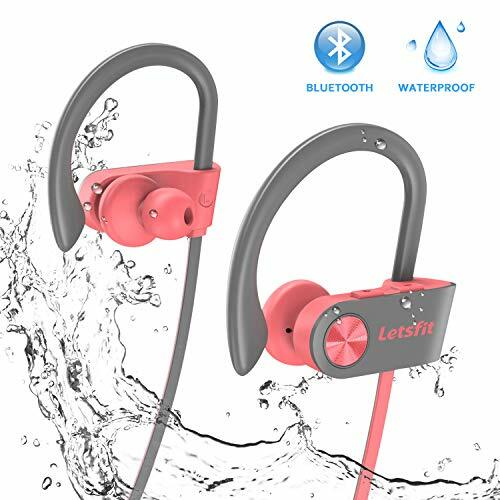 Are you ready for a long-lasting music experience, with these wireless running headphones that allows you to listen to music for up to 8 hours, take calls without having street noise interfere with your conversation and where a rainy day is not an issue since they are sweat- and waterproof? If the answer is yes – you definitely want to have a look at this product. 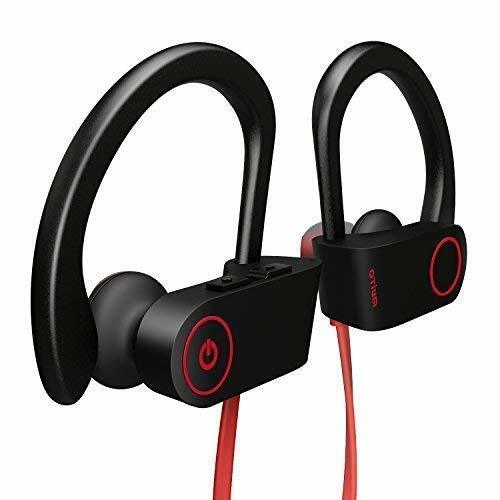 Get these headphones in the color of your choice, with the ear tip size of your choice, and enjoy the comfort of the best sport Bluetooth headphones available. Why We Liked It - When you commit to running, you often want to be able to do it no matter the weather, and this jogging headphone device is the perfect product, considering it is waterproof and stays in place even when you sweat. The on-ear controls for music and calls makes these some of the best wireless running headphones for people on the go. The P2i Nano-coating protects these sport Bluetooth headphones from the elements; such as rain and mist, and they are also sweat proof which makes them ideal also for hot weather runs. They even meet the IP57 rating, meaning that they can withstand (fresh) water of down to 1 meter, for 30 minutes! The 15-minute quick-charge feature allows you to charge an hour of listening time fast, which can save your run at times when you have forgotten to charge up your jogging headphones. Why We Liked It - Not having to worry about your earphones when exercising is a huge plus, especially if your music device – such as a phone – is also waterproof the way these are. Run in the rain or go for a quick dip in the lake! These are the best Bluetooth running headphones for exercise enthusiasts that don’t want to be held back. With high-fidelity acoustics – these sport wireless Bluetooth headphones constantly rank high in best sport earbuds reviews! They are comfortable to wear, even for long-term use, and great for any sport-related activity or where you need your earbuds to stay firmly in place. Let them impress you with their ability to connect with devices over 30 ft away, without it affecting their impeccable sound quality. The IPX7 waterproof casing and the sound-cancellation technology means that you can listen to your music and take phone calls anywhere, without having to worry about rain and/or sound interruptions. A long run can make a person feel incredibly free, and this product makes sure your headphones won’t get in the way of that. 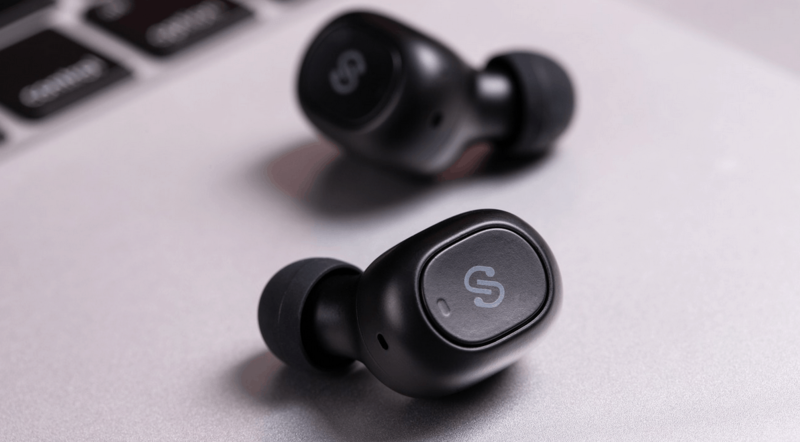 Why We Liked It - Easy to use, long-lasting battery time and the headphones have waterproof casing which make these the best wireless sport headphones in the opinions of many, and it is not hard to see why. Finding the best Bluetooth earbuds for running can take some time, but you can’t go wrong with this durable and stylish looking option. It is elegant, small, resistant to movement, sweat, and the elements, and the price is very affordable. 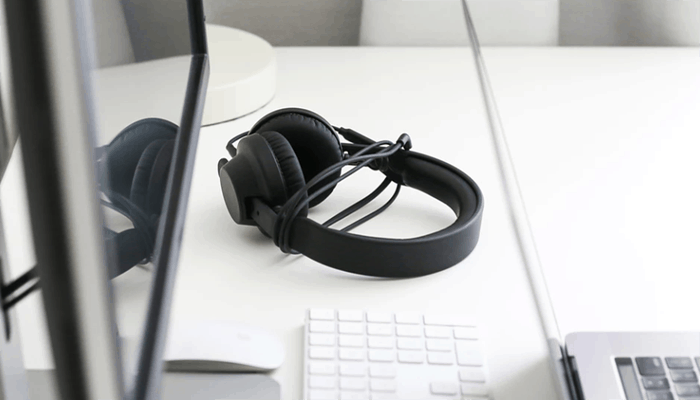 You can connect these headphones for running to most devices and cell phones, and it is compatible with both Android, iOS and other operative systems. It only takes 1-2 hours to fully charge these earbuds, which is a lot less than many of its competitors, and it helps to make sure that you never have to go for a run without music. The oblique angle provides an ergonomic and comfortable fit, and the magnetic feature makes it possible to put the two earbuds together and wear them like a necklace when they are not being used. Why We Liked It - You don’t always have pockets on your exercise gear, and there might not be room even for the best sport’s headphones where you keep your phone. This product has solved the issue by adding magnets to their earbuds, so that you can wear them as a necklace when you don’t want them in your ear. No more tangled cables or poor audio quality – these sports’ earbuds combine a sleek design with high-quality audio and high-fidelity sound, along with CVC noise cancelation, a built-in mic and a deep bass for the ultimate sound experience. Control the headphones with the buttons on the side and enjoy up to 8 hours of music or calls before having to recharge. The silicone ear-hooks are soft and comfortable to wear, and they adjust nicely to the size of the ear of the person wearing them. The Nano-coating keeps the music flowing even when it rains, and you just wipe them off when you get home to keep them in top shape. Why We Liked It - These Bluetooth headphones running enthusiasts go on about are very easy to carry with you, they sit comfortable in- and around the ear, and they come in several different colors so that everyone gets to choose their favorite. It is easy to get overwhelmed when starting to browse through products on the internet, regardless of what you are looking for! There are so many products available, and how can you know which option is right for you? The search for the best runners’ wireless headphones is no exception, but don’t worry, there are good alternatives in every price class, as long as you have an idea of what you are hoping to find. The first thing to decide is if you prefer over-the-ear headphones or ear pods that go inside the ear, and this depends mostly on your personal preferences. 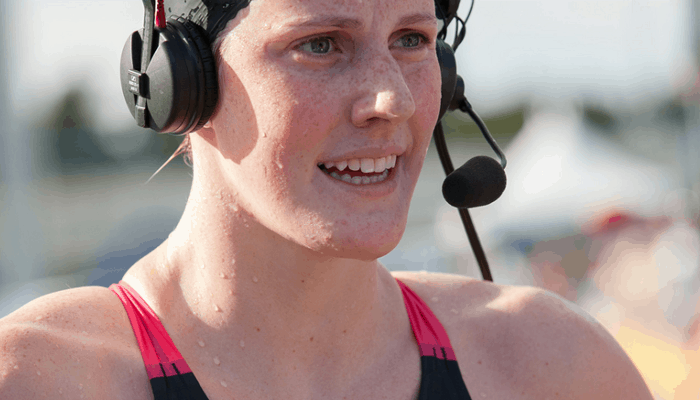 For sports like running, an in-ear design is by far the most common, due to commodity but also how much better they tend to stay in their place. Imagine running with the chunky headphones you use for computer games! Would your music sound great? Yes, but would they stay on? Probably not. Instead, you need to aim for headphones made for sports, as these have taken this little detail into consideration. 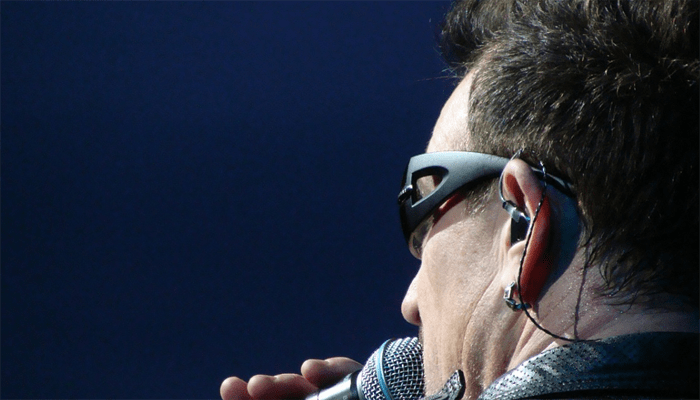 If opting for an in-ear headset, you want to make sure that you consider size and design. Not all earbud tips are the same size, and if you know that most in-ear headphones usually make you feel uncomfortable or even hurt – look for a product that has size options and chooses a smaller size for the tip. The standard earbud size is too big for many people, but most put up – not knowing there are smaller sizes. Over-ear headphones can be very comfortable, and there are a few models made for running and other sports. 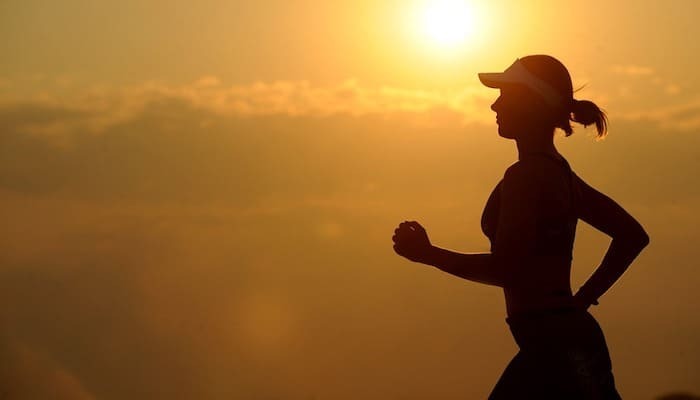 If this is more your thing, then you should take a moment to find the products that will stay on your ear even when you are running, bouncing and – who knows – perhaps even swimming, to avoid a distraction while you are trying to run. Did you know that some headphones are waterproof? This is because many people exercise even in bad weather, but also because people sweat; and exercise headphones need to be able to deal with that. 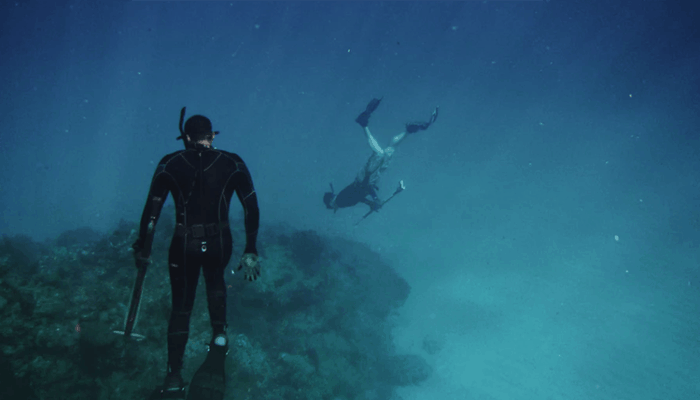 The fewer distractions when exercising the better, and with waterproof headphones, you save yourself a lot of trouble. Look for products with IPX7 casing or products that are coated with Nano, as this usually means that they are waterproof, or can at least withstand water and rain. 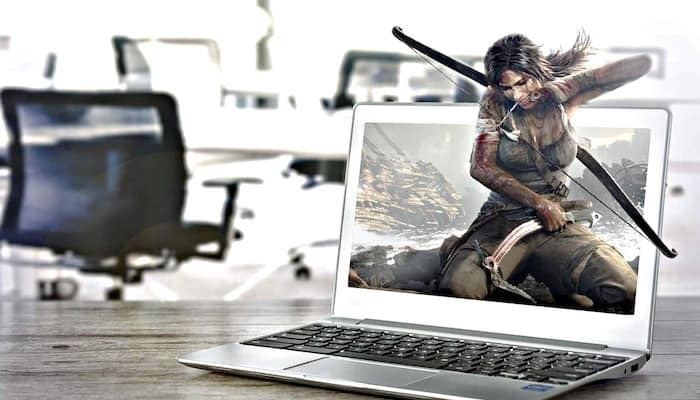 It is always recommended to read the product description carefully before using or purchasing, to make sure you are not wetting a product that is not made for what you need it for. There is also a significant difference between a product said to be “waterproof” and one that is water resistant, so make sure you don’t confuse the two. Just because your new headphones can take light rain while you are jogging, it does not necessarily mean that they will survive an accidental dip in the fish tank or going with you for a swim. If it is important to you not to have to deal with wires, and if a Bluetooth headset is what you want – make sure this is specified in the product specifications of the item you intend to buy. This is a new and innovative technology that allows you to listen to music and take calls without having to physically connect your earphones to a device, as this is instead done with Bluetooth, and it is extra useful for people practicing sports on both hobby- and professional levels. Bluetooth lets your earphones interact with your phone or music device so that you can run and exercise without getting tangled up in wires. 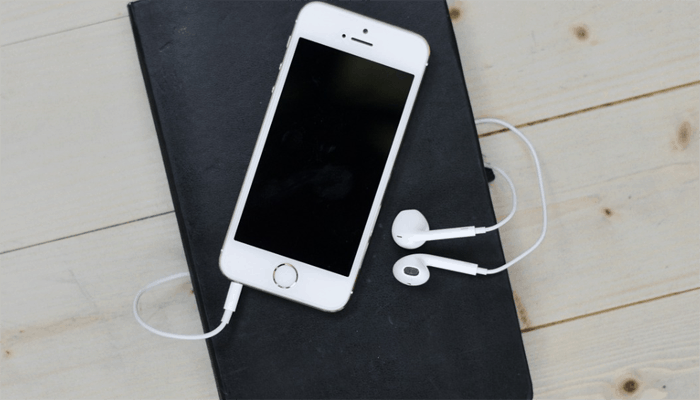 You just sync it to your device the first time, and then it will usually auto-sync to the same device the next time you use it – making it quick and simple to get the music flowing. It even allows you to share one headphone with a friend as you work out, as long as your friend stays close enough for the Bluetooth signal to reach your phone or whatever another device you use to listen to music. 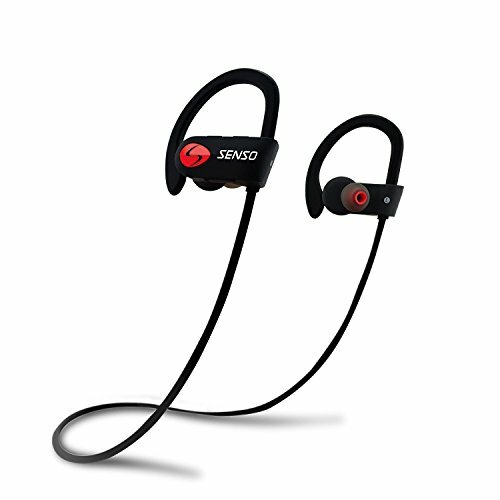 The impressive reach and sound quality of the ‘SENSO Bluetooth Headphones’ make them a great choice both for experienced runners and for those who are just starting out. The ‘Phaiser BHS-530 Bluetooth Headphones’ have a lifetime sweatproof warranty, meaning there is no risk of you having to throw away your earbuds due to having been sweating too much! The ‘Plantronics BackBeat FIT Wireless Bluetooth’ can be submerged in water for up to 30 minutes, so you can’t find a better product if you are worried about getting your headphones wet when running through the rain. Headphones differ a lot in both quality, durability, and price, and while you can go with the cheapest option and hope that they last – they probably won’t unless you know which cheap headphones make the best running earbuds. This is why it is important to read reviews, but also to take into consideration what you need them for, and how you plan to use them. Bluetooth earphones for running need to stay in place also when you are in movement, or they will end up being more of a hassle for you than a source of motivation. They should also be resistant to moist and sweat, as this is something that inevitably tends to come with working out, or you could end up having to buy new headphones after every workout session. It is not about price – it is all about design and function. Choose a size that fits your ear. If you have small ears and find most regular earbuds uncomfortable – look for a product that offers different tip sizes. Earbuds that are too big will either make your ears hurt, or they will fall out as you run. The concept of “Bluetooth” is named after a Viking (Blåtand) in the book ‘The Long Ships’, written by Frans G. Bengtsson.